In the last five years the average weekly rent has gone up $70 a week from $340 – to $410. 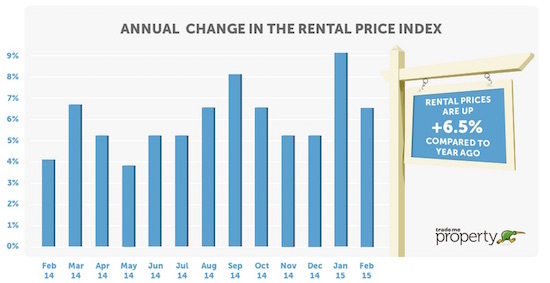 It has also climbed 6.5% from February 2014 to February this year according to Trade Me’s Rent Price Index. While you’d expect larger weekly rent rate increases in the Auckland region they were rather modest at just 5.6% with Wellington at 5% and Canterbury at 7.1%. Bay of Plenty’s average weekly rent rate was marginally more at 7.9% but the top position goes to Marlborough at a whooping 15.5%. A couple of regions slipped backwards. Gisborne’s average weekly rent rate dropped 10% in the year ending February 2015 and the West Coast also slipped backwards but not by as much at minus two percent. Northland was probably also a surprise given all the talk about the depressed local economy – it’s weekly rent rate increased by 5.1%. As a landlord it is important to keep abreast of changes in the rental market that impact on your investment’s viability. Weekly rent rate increases is one way to maintain a healthy balance. Pedersens Property Management are investors too so they know first hand it’s a fine line between profit and loss. How the property is managed can make the difference between a modest profit and or a loss so this is always front of mind for Pedersens Property Managers and it’s probably why their business won the Property Manager of the Year 2014 LPMNZ. The year ahead may see a continuation of a lack of supply of rental properties tipping the balance well and truly in favour of the landlord. Trade Me’s Head of Property Nigel Jeffries says there’s been a 12 percent drop in new rental property listings since the beginning of 2015.